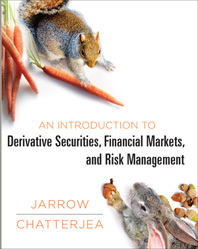 The first real introductory text in derivatives. Written by Robert Jarrow, one of the true titans of finance, and his former student Arkadev Chatterjea, Introduction to Derivatives is the first text developed from the ground up for students taking the introductory derivatives course. The math is presented at the right level and is always motivated by what’s happening in the financial markets. And, as one of the developers of the Heath-Jarrow-Morton Model, Robert Jarrow presents a novel, accessible way to understand this important topic. Co-author Arka Chatterjea’s years of teaching derivatives to a broad range of students has influenced the level and organization of the text. Seven introductory chapters, including a unique chapter on arbitage, provide overviews of topics that are addressed in detail later in the text. The math is accessible and consistently motivated by the underlying financial environment. Introduction to Derivatives carefully explains the Single-Period Binomial Model, the Black-Scholes-Merton Model, and the Heath-Jarrow-Morton Model. The authors present the Single-Period Binomial Model and Black-Scholes-Merton Model with an eye toward the later presentation of Heath-Jarrow-Morton, developing the three key models of derivative valuation in a consistent and integrated way. Risk environments make derivatives necessary and highly beneficial for businesses and the economy. The authors thoroughly explore and explain each type of risk environment: market risk, credit risk, liquidity risk, and operational risk. Developed by a Cornell computer scientist in collaboration with the authors, Priced! is Excel-based software that makes the models real rather than just hypothetical. Priced! enables students to learn models through manipulating concrete values and seeing the real-life impact of changes to certain variables such as exchange and interest rates. Instructors can use the software during lecture to provide concrete, scenario-based examples of theories discussed during the course. Students can use the software to work through homework assignments or check calculations they’ve done by hand.